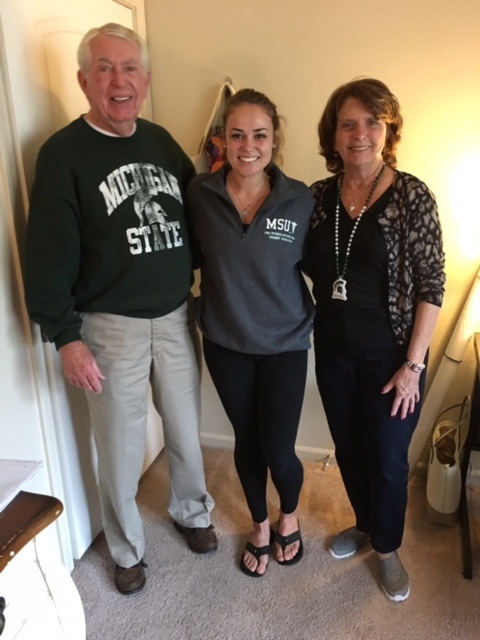 Erin Gray standing with Nick and Judy Devine in East Lansing. A 2012 Pew Research Center study states that politically, millennials tend to be more liberal and the Silent Generation tends to be more conservative. Millennials are people between the ages of 18 and 35 and the Silent Generation are people 85 and older. We often hear the political opinions of younger generations, but what about America’s oldest old? I sat down with Judy and Nick Devine, a married couple from Farmington Hills, Michigan who are part of America’s oldest generation – the Silent Generation. Judy was born in 1945 and Nick was born in 1932. Both have an extensive interest in politics and agree that America is different from when they were young. Nick developed his interest in politics in his 20’s. He came across a book that sparked his interest. On a scale from one to five, Nick said his interest in American politics is a four. “I am interested in most things that are current and politics is certainly the talk of the day, and it’s a subject people avoid because of the anger, the clash and so like religion they say ‘I have strong opinions but if you don’t share the same opinions then maybe we should talk about something else,’ which is a shame but I think it is indicative of the mood of this election,” Nick says. Today, discussion about politics can cause feuds between people. When Judy and Nick were young, people did not engage in discussions regarding religion or politics. Political discussions can quickly turn, and sound like the “Stubborn Donkey” episode of Family Guy. Judy and Nick are witnesses to dozens of elections, the evolution of technology, the Great Depression, and social movements. The Pew Research study claims millennials are more liberal than Judy and Nick’s generation and the couple says they agree. “(I) 100 percent agree, right on because that’s what I observe, that’s what I see in my life that’s happened,” Nick said. Host of his own radio show and former investigative reporter for NBC Steve Gruber says the Silent Generation tends to be more fiscally conservative from living through the Great Depression. He says his grandparents who died in their early 90s had a constant concern for the economy. “I know my grandparents who died with a significant amount of money in their bank accounts, but they never lived in a house that was any more than 1,400 square feet, it was a three bedroom, one level brick house in Monroe, Michigan, and they always drive a used car because they were scared to death to run out of money because they have seen it happen during the Great Depression,” Gruber said. Pew Research finds the economy is within the top five issues the Silent Generation cares about. The same group cares least about trade policy, the environment and treatment of the LGBT community. Judy says when she grew up in the 50s, race and interracial marriage were not openly discussed. As she spends more time with her family, she sees more of an acceptance from the younger generations. “My grand kids, my children, I’ve grown with it and as of today I feel that diversity in the schools and the acceptance of whoever, what they are, what color, what nationality, I think it’s for the good and I think it brings peace and love and acceptance and blend,” Judy said. Judy, Nick and Gruber each recognize a growing rate of acceptance on socially liberal views among the older generation. Nick and Judy both say they are optimistic about the future of America. Chris Reed is approaching her 87th birthday in December and has voted in every presidential election that allowed her to vote. Growing up in the south was difficult for an African American woman who was not at all familiar with the voting process.